Sadly, I'm talking about the King and His Court, the barnstorming softball team started by the late Eddie Feigner some 65 years ago. Feigner died in 2007, but his team has continued on without him, like the Glenn Miller Orchestra or Lynyrd Skynyrd (roughly three dozen players have played for the Court over the years). If you haven't seen the King and His Court, well, it's your own damn fault. The Court has been around since the Chicago Cubs still were the reigning National League champs, and it has played in nearly 4,000 cities and in more than 150 countries. Starbucks won't go to towns the Court does. But the 65-year tour of duty ends Saturday night in Feigner's hometown of Walla Walla, Wash., playing a team that includes former major leaguer Jeff Cirillo, a two-time All-Star and five-time .300 hitter. Good luck, Jeff. You'll need it. "I just wanted to return the van keys to Walla Walla where it all came out of," said Rich Hoppe, who has been pitching with the Court for decades. "I wanted to recognize in his birthplace that something so special happened. In an era where guys refuse $100 million because it's disrespectful, this is about guys who carried their own bags, washed their own laundry -- and at a very steep price tag to their families. It will end where it should. We're going to go up to the birthplace and bring it on home." The King and His Court got its start the way so many wonderful sagas begin -- in a bar. According to legend, Feigner was bragging up his skills one night when an opposing player challenged his abilities. Insulted, Feigner bet the guy he could beat his team with just four players -- himself, a catcher, a first baseman and an infielder. Feigner was confident he could win with only himself and a catcher but worried the other team would just walk the two and leave them without a batter. Which is why the King always had four players. You can see highlights of the King and His Court from about 50 years ago here and a news report from about 15 years ago here. AP Photo Eddie Feigner formed the King and His Court more than 14,000 games and 4 million miles ago in his hometown of Walla Walla, Wash.
Over the years, the Court played everywhere, with Feigner firing his 100-plus mph heater (once measured at 112 mph) from behind his back, through his legs, from second base and even while blindfolded. It must be fun facing a blindfolded pitcher from 45 feet who can fire the ball faster than 100 mph. Feigner claimed nearly 10,000 victories, 141,000 strikeouts and almost 1,000 no-hitters. He struck out Willie Mays, Willie McCovey, Brooks Robinson, Harmon Killebrew and Roberto Clemente consecutively. He made Nolan Ryan look like a Little Leaguer. Feigner was Sidd Finch with a crewcut, Clint Eastwood with a fastball. "The King changed my life, and he was the toughest guy I've ever been around. He just made me better," Hoppe said. "I miss the guy, I really do. He was a hard-boiled egg. He was like a drill sergeant who drills you every day and you never do anything right." Hoppe is a natural lefty who lost full use of the arm in Vietnam and taught himself how to pitch right-handed. "Rage and obsession can make you do amazing things," he explained. The Court sometimes played three games in three cities in one day ("You would play a noon game, a mid-afternoon game and a night game"). It played in Saudi Arabia, the jungles of Thailand and near the DMZ between North and South Korea. Hoppe remembers playing in 100-degree heat in Tacoma, Wash., one day and in sub-zero cold the next day in Barrow, Alaska. They escaped flash floods and tornadoes. They played in prisons where the inmates bet cigarettes on the outcome. They endured enough 30-hour rides between cities that Feigner referred to a 10-hour ride as "just down the road apiece." "If you did one tour with the Court, you've been tested. To do more than one tour, you're certifiable," Hoppe said. "It was like being on the Rolling Stones, only with a softball." Of course, the Stones never played my hometown or the hundreds of other towns that are even smaller. The King and His Court went to towns even McDonald's ignores. That was the beauty of the team. No town was too small for them, no fans too unimportant. "I got to be part of something where they watch you tie your shoelaces," Hoppe said of the attention the Court occasionally received. "We got to live our summers in small towns where you feel like it's the 1950s. In the days of xBox and 15-screen Cineplexes, it was something to see ballparks packed with five generations, with great-grandfathers and fathers holding little babies." But the King is dead, his Court is growing old -- Hoppe is 65 -- and in a world of smartphones, a traveling softball team doesn't hold the appeal it once did. "We can't compete with modern entertainment," Hoppe said. "The day of the barnstormer is buried this Saturday." So do yourself a favor this weekend. If you live anywhere in the Northwest, go to Walla Walla this Saturday to see the end of an era. Hell, if you live anywhere, get to Walla Walla. It's your last chance to see a legend, and as the King would say, it's just down the road apiece. "It's surreal. It's absolutely like your life is flashing in front of you," Hoppe said. "It's magical and joyful in a way, but this has been on my radar since 1958 when I was a kid in the stands and saw the King for the first time. And that feeling has never left. "Hollywood missed a hell of a story. Not enough people died, I guess. And there were not enough bare-chested women, though there were a few of those, too." Courtesy of Topps Tim was voted "Most likely to never get caught at Supercuts." 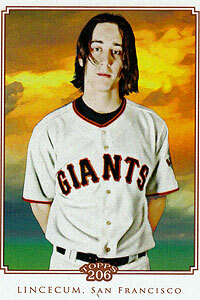 Hey, I'm a big Tim Lincecum fan but this card (2010 Topps 206, No. 255) may be the equivalent of the high school annual photo. Either that, or an outtake from "Twilight 4: Team Timmy No-Hits Team Edward.'' I also fear Buck Showalter's head would probably explode if a player showed up looking like this. We had some interesting lines this week. Florida starter Ricky Nolasco had an atrocious game Wednesday when he allowed 11 runs in three innings (3 IP, 11 H, 11 R, 11 ER, 1 BB, 2 K). Cleveland's Chris Perez hit two batters, walked another and allowed an unearned run Monday (1 IP 0 H, 1 R, 0 ER, 1 BB, 2 K, 2 HBP) while Atlanta Jair Jurrjens pitched 6 1/3 scoreless innings despite allowing 13 baserunners (6 1/3 IP, 8 H, 0 R, 0 ER, 5 BB, 1 K). Yes, he faced the Cubs. Oswalt started the next night and threw eight scoreless innings. Which brings up an interesting question: When was the last time the starting pitcher appeared in box scores on consecutive days with no runs allowed in either game? Anyone? Anyone? Bueller? This Space For Rent Stadium, Florida. The Marlins are about to enter their final month at their home stadium, which has had seven official names (if you count minor changes from Park to Stadium and from Dolphin to Dolphins), none of them ever spoken in endearing terms. My favorite was Land Shark Stadium, which it was called for one year after a deal with Jimmy Buffet. This place hasn't exactly been as enticing as Margatitaville but it isn't that terrible either, especially as multi-purpose stadiums go. Though it would be nice if Florida ownership could have found the money to keep the out of town scoreboard. The Marlins will be hard-pressed to equal their two World Series championship at their new ballpark that opens next season. You know, there was a time when communities built stadiums to efficiently serve multiple teams and sports, and the fans were perfectly content as long as the team, you know, won. Those days are long gone -- now luxury suites and revenue streams are all-important -- and based on the vast expanses of orange, empty seats always visible at Marlins games, those days may have never existed here. I Can See The Steam Spouting From the Steinbrenners' Ears From Here: You want a meaningful race between the Yankees and Red Sox? Don't add another wild card and a hokey one-game playoff -- just eliminate the wild card. Then those two teams will really have something to play for. (And don't rule out the Rays grabbing this year's wild card spot yet.) Adding teams to the postseason doesn't increase the tension of pennant races, it diminishes it. More Impressively, He Even Made a Trip to Toledo Seem Worthwhile: Props to Tigers veteran Brandon Inge, who accepted a demotion to the minors in mid-July and then returned with a home run in his first at-bat back with Detroit on Saturday. Lies, Damn Lies and Statistics: How big was the crowd in Williamsport for the Little League World Series? More than 66,000 fans attended the four games Friday, including a LLWS single-game record of 41,848 for a game with a Pennsylvania team. Meanwhile, as ESPN colleague Doug Kern points out, the last four Rays home games drew just 61,897. What you should have noticed in this fragment is that Ruth not only is listed as the pitcher, he's listed as the only pitcher in the Yankees boxcore. 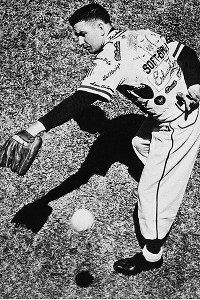 In his final game as a pitcher, Ruth allowed five runs on 12 hits, walked three and struck out none in a complete game at the end of the 1933 season. That gave him season marks of .301, 34 home runs, 101 RBIs, a 1.023 OPS and a 1-0 record. Not bad for a fat man. The Yankees rewarded the biggest star in the their history with a 30 percent paycut. Nice guys, huh?